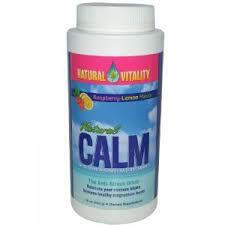 Natural Calm is one of the best-selling magnesium supplements that help you maintain healthy magnesium levels. It's the only water-soluble magnesium blend utilizing an exclusive delivery formula and balanced pH, which provides superior magnesium absorption and maximum benefit. Just add hot water and enjoy this anti-stress drink like hot tea. Ingredients: Ionic magnesium citrate (created from a highly absorbable proprietary blend of citric acid and magnesium carbonate), organic raspberry and lemon flavors, and organic stevia. DIRECTIONS: Place powder in a glass or mug: add 2-3 oz of hot water. Let it fizz, then stir until dissolved. Fill with warm or cold water and enjoy. You can also simply add Natural Calm to a glass or bottle of cold water. Use only as directed. FOR BEST RESULTS, divide your daily amount of Natural Calm into two servings. Natural Calm can be taken with or without food. When bowels are comfortable loose, this is the optimal amount.